Time travel and secret societies are the kinds of things I would usually be cautious about in a book; reading them only after I’ve heard a lot about them. I like the magical elements to feel real. But, I decided to take a chance on this book, partly because I love time travel books if they are done well, and partly because, so far, the books I have read from Wolsak and Wynn, and the books featured on All Lit Up, haven’t let me down yet. And, sure enough, Matt Cahill has written a fun, inventive novel about time travel and secret societies that had me guessing the whole way through. I had a lot of fun reading this book. 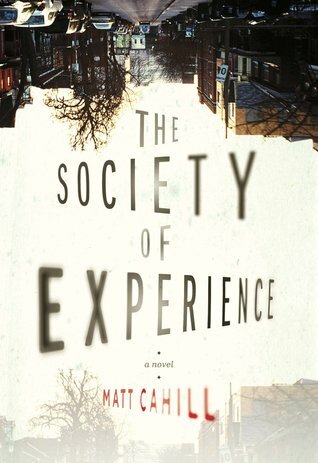 In the midst of the deep dark sinkhole Derrick finds himself in after his father’s death, the mysterious Society of Experience offers him a chance to take part in an experiment. The catch is that he can’t know about it unless he signs on. The experiment turns out to be pretty wacky and for a long time he feels like he’s being duped (“A part of me thinks I’m a born sucker. I may be right.”). We go along with him as he tries to figure out what is going on, whether or not any of this is real, and what any of it has to do with him. … we involve our members by exposing them to situations that motivate them toward becoming better people through the agency of direct experience. Realizing what I’d just signed and handed over, from every caution I’d heard growing up: if it’s too good to be true, it probably is… It probably was. And yet, despite it all, it still seemed more fun than reality. The characters in this book are just as skeptical about what’s going on as we are as readers. Is it possible that it’s all just an elaborate deception? But, if so, to what purpose? If it is real, what could the repercussions be? What would happen if Derrick decides to break the rules of the society, test his limits? My first thought after finishing the book was crazy (a good crazy). Just go read it and see for yourself. What are some of your favourite time travel books? Thanks again to Wolsak and Wynn for providing me with a copy of this book! Like you, I’m not big on time travel books. One I did enjoy (besides the Niffenegger) is The First Fifteen Lives of Harry August by Claire North. I preferred that to Life After Life by Kate Atkinson. Like you, the idea of time travel make me want to run a mile in the opposite direction – although I did enjoy The Time Traveller’s Wife – but it sounds as if a healthy dose of scepticism helps it along nicely. I found it helpful, and much more believable, that the characters were questioning everything at the same time as I was. It also made me that much more curious to find out what was really going on. I was really excited to read The Time Traveler’s Wife but ended up getting turned off by it and didn’t finish. Since then I’d developed a kind of mental block against reading time travel novels but maybe if it’s done well, like you said, I could change my mind, especially since I find the concept of time travel fascinating. I am curious about HG Wells The Time Machine, and wonder how it was done originally. I do like time travel books/multiple life books, but, yes, they have to be GOOD. I was so happy that this one was. Not an easy kind of book to write! I am not a Stephen King reader, but I have a friend who loved 11/22/63. I loved The Time Traveller’s Wife. I just recently read another time-travelling book that I didn’t think was as good, although it was very popular, The River of No Return. Haven’t posted my review yet. I’ll be watching for your review! I would say it was fairly meh, too. Well, to be fair, it was a lot more of a romance than I like. So, also a matter of taste. I would probably agree with you. Like everyone else here, I loved The Time Traveler’s Wife. I think that’s my favorite time-traveling book. And I liked the first few books in Diana Gabaldon’s Outlander series. (Although once there were too many time-traveling characters, I lost interest.) Cahill’s book sounds like fun; it can’t be too good to be true, can it? (Don’t answer….) It’s great that your trusted source for recommendations has come through for you again. It was also so relieving. I would have hated not to like it. But I kept seeing it and it kept calling for me to give it a try. I haven’t thought of Finney’s Time and Again in ages, but I loved it. I may have read it in college, maybe a little after. I started the Stephen King book but never finished it, have been meaning to get back to it. The Stephen King book is long, and can feel repetitive at times. I found that there were a lot of reminders that history repeats itself.But I enjoyed it overall. I have good memories of Time and Again. It’s one of the first books my mother suggested I read from her own bookshelf. Your description reminds me vaguely of a movie I saw a long time ago (The Game, with Michael Douglas). Though as I recall that was pretty dark. I liked The Time Traveler’s Wife (but I had some issues with it) and I’m an Outlander fan. And then there’s A Wrinkle in Time . . .
Oh, yeah, A Wrinkle In Time is a good one! I loved The Time Traveler’s Wife, even though I felt confused at times. Is it really time travel, or is it a deception?? Thanks for showing me your list – and now I have found you on GR! I haven’t read The Time Traveler’s Wife but I’d take Eric Bana in the movie any day! LOL. Would you say the Narnia books are time travel? I think so. Those would be my favorite perhaps. Yes, those would be time travel. I hadn’t even thought of those – good choice! Wow, this books sounds so good and even the comment section has been a good source of interesting books to put on my TBR. I feel like I should read 11/22/63 and Life After Life soon. Time travel and secret societies are things I gravitate towards, so thank you so much for the rec! Maybe you just picked our Speculative Fiction read for Write Reads. Time Traveler’s Wife was just a weep fest of emotionality for me, though kinda like a lot of romantic books, there are some pesky issues that come up if you think about it too much :). When You Reach Me and A Wrinkle in Time are great, and I picked up the Atkinson recently…holy crap, when I google it, I realize I really haven’t read a whole lot of time travel books. I would love to know what you (and/or Kirt) think of this one! I feel like it’s out of the norm for me, so I would love feedback from others. One thing about reading books that haven’t been reviewed a lot is that I don’t get to hear what others have thought after I read it. It’s not quite as satisfying. On the other hand, I do find spreading the word about good lesser-read books very satisfying. I did think this was a great book! I cried a lot while reading The Time Traveler’s Wife, too. That one really got me. When I was a girl I absolutely loved time travel. Kids falling through mirrors or wandering into gardens, finding themselves in unexpected places? Couldn’t get enough of them. As an adult, maybe I was disappointed somewhere along the way, because I don’t pick them up as often. But I just finished Connie Wilis’ The Doomsday Book, having learned that it sort of comes before a book which I absolutely loved about a decade ago (To Say Nothing about the Dog, also a riff on Jerome K. Jerome’s Three Men in a Boat), part of a set of companion novels set in a world which is markedly like ours but in which time travel is a given, part of engaging with history in an organized and regulated manner. As she depicts it, it seems very ordinary and cool at the same time. TSNatD had to do with the London bombings in WWII and was quite interesting and, as I recall, funny. TDB is less funny, but still has some nice ironic bits and quiet chuckles along the way, but feels like more of a historical novel to me, set in “present-day” and in medieval times, during the plague years. Once I realized the connections between a quarantine situation in the “present” and the Black Death takes hold in the “past”, I settled right into the story and was so sorry to let the characters go in the end. Fortunately, there are two more volumes and a short story. I remember loving them as a girl, too, and also end up getting them for my kids thinking that they’ll be a hit. A Wrinkle In Time, of course, I loved. And my daughter and I loved the Rebecca Stead book. And there seem to be quite a few about seeing other little girls in mirrors or windows, and then falling into their worlds (either the past, or just a different timeline). I’ve never heard of any of these books by Connie Wilis – I’ll have to go check them out! I’m always excited to pick up books about secret societies, but I share your caution when it comes to picking up books about time travel. I feel as though it’s very easy for time travel novels to go badly wrong, especially the world building. I actually can’t think of any time travel novels I have enjoyed off the top of my head. I’d say the secret society plays a bigger part in this book than the time travel, but they are definitely linked together. Also, the characters are so skeptical about the time traveling in this book, which helps make it seem more believable (for me, anyway).